The U S Navy was late off the mark in establishing an organization and an institutional culture that would conduce to investigations into the physiologic and psychological problems faced by pilots operating ever more sophisticated and capable aircraft. As one early researcher told it, the medical men often had to use stealth, or “brute force”, to get themselves on teams of engineers and others who were working with the aviators as they pushed ever newer limits of speed, altitude and maneuverability. Finally, with war clouds on the horizon, the Navy organized a research establishment–the Medical Research Section in the Bureau of Aeronautics–and its own School of Aviation Medicine, in 1939. As I described in the last post, Commander John R Poppen, Medical Corps, USN, had done early work in the development of anti-blackout gear in the mid thirties. The result of this work was the “Poppen Belt”, an abdominal belt that increased pressure in the abdomen to reduce pooling of blood in the great vessels of the abdomen during high-G maneuvers. The Navy followed up on this early work with G-suit prototypes constructed in 1940. While the basic principles elucidated by Poppen and his team remain the basis for modern G-suits, none of these work completely satisfactorily, mainly because of very slow heart rates and potentially dangerous heart irregularities that result when the suits are activated. Another area of concern taken up by Navy researchers almost from the opening of the School of Aviation Medicine was that of “disorientation”, which can result from all variety of aerobatic maneuvers and situations. Disorientation can manifest itself as vertigo (dizziness), motion sickness and “visual illusions” that result when there is no clear horizon or other visual cues for the aviator to depend upon for the orientation of his aircraft. It was this latter type of disorientation that contributed to the death of John F Kennedy, Jr. and his wife, in 1999, when the aircraft he was piloting crashed into the Atlantic off Martha’s Vineyard. Pioneer Navy researcher Dr Ashton Graybiel spent much of his career working of problems of visual illusions and of motion sickness. This work contributed to an ever-increasing emphasis on training pilots for the use and reliance on flight instruments (Kennedy was not instrument qualified). Pilots were taught to avoid “seat of the pants” flying except when visual conditions outside the aircraft were ideal. Dr Graybiel’s later work also led to medical treatments to prevent airsickness, including the commonplace scopolamine patch, a “standard” even today. In 1940, the Naval medical researchers, in conjunction with the National Research Council Committee on Selection and Training of Civilian Aircraft Pilots, commenced what became known as the “Thousand Aviator Study”. Initially intended to explore the value of psychological and physiological testing as predictors of pilot training success, the study has since expanded in scope and numbers of people studied. At the outset, a large variety of promising pilot screening tests were studied, resulting in the selection of the Flight Aptitude Rating and Aviation Qualification Tests, both of which are still in used today, in modified form, for pilot candidate selection. The Thousand Aviator study lives on in the form of follow-on work called “Special Studies” undertaken to follow Vietnam POWs, the 1980-81 Iran hostages and POWs from the 1991 Iraq war. As late as 2005, results of studies on the balance mechanisms of middle-aged men came out of the Thousand Aviator Study. This work may help us understand the balance problems people experience as part of getting older. The Navy research programs during World War II undertook work in a vast variety of areas, some of which I hope to detail in future posts. Next year marks the 100th year of U S Naval Aviation. In this series, I review the history of aviation medicine in the U S Navy. Slowly, navy medical men did insert themselves into aviation programs. In 1924 the Bureau of Aeronautics (BuAer) and the Bureau of Medicine and Surgery (BuMed) agreed upon qualifications for naval flight surgeons: a three-month course at the Army School of Aviation Medicine and three months’ satisfactory service in an aviation unit before designation. The rules did not require flight surgeons to actually fly, except in emergencies and or if the medical officer otherwise expressed the desire. In 1927, the navy initiated its own flight surgeon course, given at the Naval Medical School in Washington, on the site of the current BuMed, on the grounds of the old Naval Observatory directly across 23rd St NW from the U S State Department. It wasn’t until 1932 that U S navy flight surgeons first undertook a formal research program. This came out of the appreciation, learned in the late war, that the centrifugal forces (“‘g” forces) created by aircraft maneuvering could cause pilots to lose consciousness. The Germans began research in the matter in 1932. In the same year, Lt Commander J R Poppen, MC, USN initiated a Navy-sponsored investigation into the physiological effects of the high acceleration and deceleration that aviators encounter in dive-bombing and other violent air-combat maneuvers. The research, carried out at Harvard University, pointed to the advisability of developing anti-blackout gear (we’d say “anti-G” suits), which followed in 1933, when the Naval Aircraft Factory produced an abdominal belt based on Dr Poppen’s specifications. 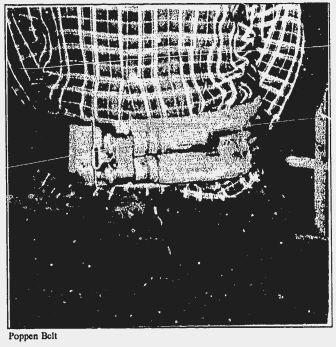 In 1940, naval officials approached a New York corset make to create an inflatable belt following Poppen’s suggestions. They did so, integrating a valve that could adjust the belt pressure according to the g forces encountered. The same year, John Fulton suggested that pressure leggings, inflated by a common source, could be added to the set-up. Suits based on these principles and crafted by the Naval Aircraft Factory under Dr Poppen’s supervision, showed, in 1943 trials, that pilots’ tolerance to g-forces encountered in gunnery runs could be increased by three- to four-fold. Today’s anti-G suits still use the principles established by this early Navy work. In August 1939 BuMed detailed a medical officer to the Bureau of Aeronautics to work on establishing an aviation medical research unit, and in November the Navy School of Aviation Medicine accepted its first class of 9 Naval Reserve medical officers. These moves laid the foundation that would permit Navy aviation medicine to play a full role in research and care to the fleet in the approaching war. The Naval Order of the United States, at its annual Congress in October will celebrate 100 years of U S Naval Aviation. Prompted by this event, I think it is well to consider the history of U S naval aviation medicine. Part one of these jottings (see below) discussed the experimentation and the best medical thinking that accompanied the earliest flights–ascents to ever higher altitudes–in balloons. In Part Two, we saw the beginnings of an actually flying service in the Navy, and noted the early response of BuMed (the Navy’s Bureau of Medicine and Surgery) to the medical needs of that fledgling Naval arm–establishing physical and mental standards (in a most general way) for prospective aviators. But until the advent of World War I, the medical response to the challenges of aviation to human physiology and psychology was a seemingly casual affair, since the slow and level flight of pre-war machines demanded little of aviators other than strength and bravery. During World War I, the naval aviation establishment grew from one air station, 54 aircraft and 48 aviators to 43 air stations (14 in the U S and Canada, the rest overseas, mostly in Europe), 2107 heavier-than-air machines and about 1600 aviators, both Navy and Marine. These men (thus it was in those days) were medically screened for training based on the rudimentary standards promulgated by the Bureau of Medicine and Surgery in 1912. The physicians who cared for the aviators throughout the war were men who, by and large, had no special training or interest (unless they be Ear/Nose/Throat specialists) in the medical problems unique to flying. No formal naval flight surgeon training would be contemplated until after the war. The one pilot protective apparatus instituted in these early years was the seatbelt restraining device. Pilots called for installation of the devices to keep them securely seated as their airplanes bumped along the rough airfields of Europe–in essence so they wouldn’t fall out of their machines! The aviators incidentally learned that the belts helped them in airborne maneuvering as well. A British study of aviation-related deaths completed in 1917 showed that only 2% of these deaths resulted from enemy action and 8% to machine failure, while 90% were directly attributable to pilot problems; the American war-time experience was similar. Almost all early initiatives in the area of aeromedical research and training began with the Army. In 1918, the U S Army established the Air Service Medical Research laboratory on Long Island, NY. out of which came the Army School of Aviation Medicine. The Navy sent its first cohort of surgeons for training there in 1921, and the five men graduated on 29 April 1922. One of these men, LT Victor S Armstrong, MC, USN, received appointment as the first Chief of the Division of Aviation Medicine at the Bureau of Medicine and Surgery in 1923. I’ll take up the topic of interbellum aeromedical research in my next post on the history of U S naval aviation medicine. This week marks the Battle of Gravelines, in which English naval forces defeated the Spanish Armada and saved Protestant England from invasion by the forces of the Catholic King of Spain. For about 15 years, from 1572, English privateers, with quiet support from Protestant Queen Elizabeth I, had been harassing and capturing Spanish merchantmen and gold fleets, and raiding Spanish ports, especially in South America and the Spanish Indies. Irate at these depredations, Philip II who viewed himself as the protector of Catholicism, was eager to invade England, depose the Protestant Queen and punish the English people. For this purpose, he created the largest invasion fleet heretofore seen. Faced with this threat, the English reinforced the Queen’s rather minimal fleet of 25 ships with armed merchantmen. Having learned lessons from their commerce-raiding days, the English admirals had developed a stand-off strategy—using long-range gunnery to maim the enemy’s men and damage or destroy his ships. The Spanish stuck with the “grapple, board and hand-to-hand” combat that they had used so successfully in another epochal sea battle, at Lepanto, against a massed Muslim fleet, just 17 years earlier. Lacking today’s knowledge of disease cause and of sanitation, the surgeons and physicians of the day were powerless to fight the epidemic. Both British and Spanish fleets suffered catastrophic losses of manpower—the English losing more than 20% to disease in the month before battle was joined. In fact, it was on the urging of his admirals—who counseled early battle before disease rendered the fleet impotent–that Lord Effingham launched fireships into the Spanish fleet lying at Calais. The Spaniards were thereby forced–unprepared for battle–from their anchorage in the middle of the night. In the resulting melee, superior English long-range gunnery and shiphandling carried the day, and after the battle, weather, sickness and poor Spanish seamanship finished the job. Only about half of Philip’s Armada, and less than half the men he’d sent out, ultimately returned to Spain. Historians don’t often detail the critical impact of sickness in war, but as Sir William Osler wrote in 1915 “Pestilence has always dogged the footsteps of war, and the saying is true–‘Disease, not battle, digs the [sailor’s] grave…’ The fates of campaigns have been decided by mosquitoes and flies.” Today we take for granted that we will provide our sailors with wholesome food, sanitary food preparation and healthful living conditions. But these were, in reality, late nineteenth and early twentieth century innovations, brought about, often over the objections of military leadership, by medical officers applying the advancing sciences of bacteriology, epidemiology and public health. My sources for this article are Volume I of the magisterial “Medicine and the Navy–1200-1900”, begun in 1957 (Vols 1 & 2) by Surgeon Commander John J Keevil, RN, and completed–after Commander Keevil’s untimely death–in 1963 (Vols 3 & 4) by Professor Christopher Lloyd and Surgeon Captain Jack L S Coulter, RN; “Sea Power–A Naval History” edited by E B Potter; and Sir William Osler’s essay / speech “Science and War”, 1915.